Hello Stampers! Hope your week is going great! I'm so excited to share with you tonight a sneak peek of an upcoming hostess stamp set, Banner Greetings. I'm going to love this set! It'll be featured in the upcoming 2013-2014 Annual Catalog. As I have mentioned before, banners continue to be popular. When I saw this sentiment I couldn't wait to pair it with the current Make a Cake stamp set! I saw this sketch from The Paper Players and I wanted to play along. This is such a cute sketch! Make sure you check out the creations from the design team members. I think I will use it for other cards. As I was creating this card I was thinking of my dear cousin Zoraima, she and her husband are expecting their second child and they are having a girl! Congrats cousin! They currently live in Seoul but will be coming home for the summer soon. I hope she likes it. The base of my card is Pink Pirouette and I layered it with Primose Petals. The Pretty In Pink DSP is from the Subtles paper stack. I love pairing Early Espresso with any of our pinks. Thanks for stopping by today. Have a fantastic Friday! Until next time. What a pretty monochromatic card! I love the little pops of black and the pretty flower with the dahlia. Very cute card! That little "Baby Cakes" banner is so sweet! 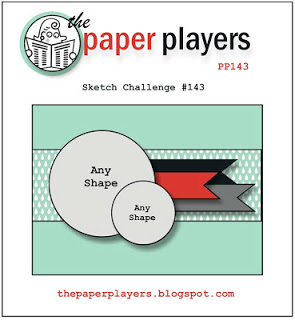 Thanks for sharing this with us at the Paper Players this week!